Malignant pericardial effusion is common, being reported in 5–15% of all cancer patients. It most commonly arises from metastasis of lymphomas and of tumours of the lung, breast and, infrequently, the gastrointestinal tract. We describe the case of a 76-year-old woman who presented to the emergency room with cervical adenopathies and clinical signs of acute heart failure. The nodes were biopsied and found to be consistent with adenocarcinoma of the colon. CT showed thoracic lymphatic involvement but no evidence of other organ involvement. The patient developed cardiac tamponade and required emergent pericardiocentesis. To our knowledge, this is the first report of metastatic colon cancer without direct involvement of the pericardium or other solid organs. Letonja M, Debeljak A. Cardiac tamponade as the initial manifestation of pulmonary adenocarcinoma. Radiol Oncol 2007;41:161–165. Maisch B, Seferović PM, Ristić AD, Erbel R, Rienmüller R, Adler Y, et al. Guidelines on the diagnosis and management of pericardial diseases. Eur Heart J 2004;25:587–610. Riihimaki M, Hemminki A, Sundquist J, Hemminki K. Patterns of metastasis in colon and rectal cancer. Sci Rep> 2016;6:29765. Halthore AN, Levy A, Philip T, Teckie S. Massive liver metastasis from colon adenocarcinoma causing cardiac tamponade. J Commun Support Oncol 2018;16:e40–e4237. Imazio M, Adler Y. Management of pericardial effusion. Eur Heart J 2013;34:1186–1197. 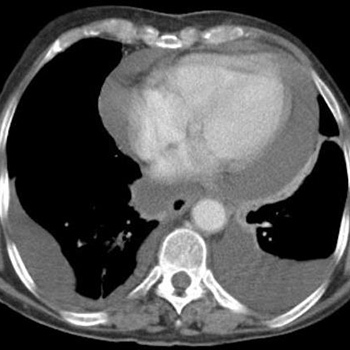 Scheinin SA, Sosa-Herrera J. Cardiac tamponade resembling an acute myocardial infarction as the initial manifestation of metastatic pericardial adenocarcinoma. Methodist Debakey Cardiovasc J 2014;10:124–128. Sankey C. Colon cancer presenting as malignant pericardial effusion. Abstract 97801 presented at Hospital Medicine 2012, April 1–4, San Diego, CA.